Sylvia Pankhurst’s WORKERS DREADNOUGHT… in 1922! 1)	It is your duty to keep the capitalist system going. There always have been rich and poor, and there always will. 2)	Pay your T.U. officials as much as possible; they will then feel like gentlemen. The more you pay them, the harder they will work to keep the capitalists on your backs. 3)	Never do any thinking for yourselves. Let your T.U. officials make all the rules for you. 4)	Never attend a branch meeting. You might get to know too much about your T.U. leaders. 5)	If you find your brains begin to work, read a sports paper. 6)	Never read a Socialist paper or pamphlet. Make a point of only reading the Capitalist Press. You want to hear all the lies possible about your own class. 7)	Remember the earth is the landlord’s. Always be contented with your lot. 8)	If the wife complains that she cannot keep house on your wages, tell her that she is living in a free country and has the right to starve. 9)	Never listen to socialist speakers. They want to make the world a better place for the workers. 10)	Always work overtime, when possible, so as to keep the other men out of a job. 11)	Yours is a good old-fashioned union. Keep it as it is, so that you can fight all the other unions. 13)	Do blackleg labour wherever possible, either as an individual or by voting to keep your union at work to blackleg the other union which is out on strike. 1)	Keep the present system going by every means in your power. It provides you with a good berth. 3)	Forbid any mention of class war. 6)	Make your Union affiliate with Amsterdam Yellow International. * You may as well get some of the pickings. 7)	Keep in with the League of Nations. It is the thing. International Capitalism for ever! 8)	Avoid a strike unless you are quite certain that the men will lose. 9)	Never let your union enter on a sympathetic strike. It might make the men class-conscious. 10)	If a general strike is in the air, hang out negotiations as long as possible, and break the spirit of the men. 11)	If a general strike seems inevitable, you may allow your Union to join in, after it has done as much harm as possible to the men on strike. 12)	If a general strike looks like being successful, despite all you have been able to do to the contrary, you may yet save the situation and get your wage slaves back to work for the master class by talking about democracy and the ballot box. 1)	Keep the present capitalist system going. It provides you with good jobs. 3)	Remember that the capitalist system is based on the real ignorance of the workers. Therefore flatter the workers that they are educated, then you can stuff them with as many lies as you choose. 4)	Engage in benevolent schemes for helping the poor, and get the rich to assist you with funds. This makes the workers forget that it is they themselves who have really produced the wealth. 5)	Having got the rich to assist you with funds, placade their names in your papers. This makes the workers forget that these people – not the German workers – are their real enemies. 6)	Affiliate with the Amsterdam Yellow International because the international capitalist League of Nations has bestowed on it its blessing. 7)	Set up as many industrial boards as possible in the country, so that master and men can be brought together in a friendly way. This will take the fighting spirit out of the men. 8)	Talk much about the many blessings of democracy. This makes the workers forget that they are now enjoying the one blessing that democracy has always given them – The Right to Starve. * Today we would say ‘with the International Confederation of Free Trade Unions’… or even ‘with the World Federation of Trade Unions’ – for all the difference it makes. ** Things sure change! 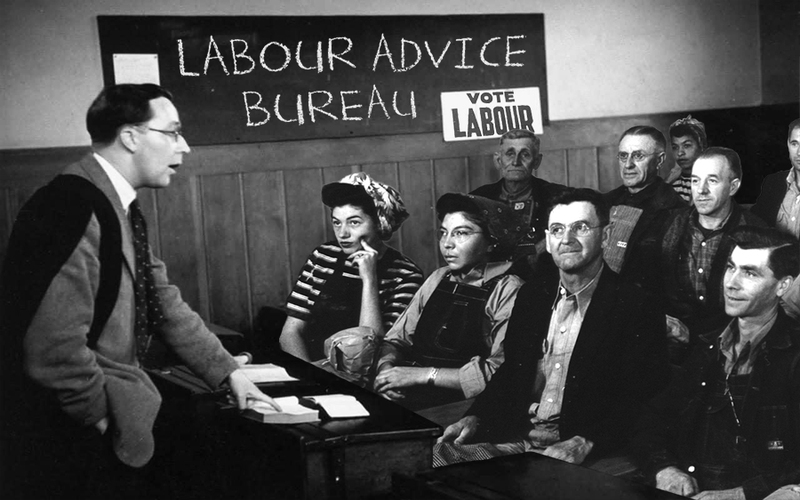 Labour leaders now disregard this advice. They praise Russian managerial efficiency. They pose as international ‘Lefts’… and get away with murder in their own outfits. The odd article in Labour Monthly, the occasional advocacy of Summit Talks or East-West Trade and any faker can today be sure of ‘left-wing’ support! Never read a Socialist paper or pamphlet. Make a point of only reading the Capitalist Press. You want to hear all the lies possible about your own class.